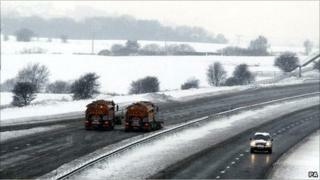 Travellers, shoppers and football fans faced a day of disruption after heavy snowfall in north-west England. Hundreds of vehicles spent Friday night stranded on the M6 after a lorry jack-knifed in the snowy conditions. Ambulance bosses warned of delays reaching patients in some areas, while transport operators said disruption to services could continue on Sunday. Premier League fixtures in Liverpool, Wigan and Blackpool were called off. Motorists were advised against travel. Up to 10in of snow fell in parts of Cheshire, Lancashire, Manchester and Merseyside on Friday night. It caused widespread disruption on the roads and the M6 crash happened at about 0030 GMT, leading to tailbacks and stranded vehicles on the M61, M62 and M58. Lancashire Police said a major incident plan was put into place and highway patrol vehicles spent the early hours travelling up and down the carriageway handing out food and water to stranded people. The North West Ambulance Service (NWAS) took more than 1,300 emergency calls between midnight and 1500 GMT on Saturday and warned of delays reaching patients. A spokesperson warned that some people "may find that they are having to wait longer than usual for a response". "Please be patient and rest assured that we will reach you as quickly as possible," they added. Football fixtures in all leagues across the region were called off because of the weather conditions. Wigan's fixture against Aston Villa was cancelled because of "freak weather conditions in the town" which made it hazardous for fans to travel, said the club. Liverpool's home match against Fulham was called off due to icy conditions around the ground and Blackpool's game on Sunday also fell victim to the conditions. Travel operator Merseytravel said the Soccerbus service for football fans was cancelled and warned of major disruption to other bus and rail services. Air passengers taking flights out of Liverpool's John Lennon Airport, which was closed for six hours overnight, were advised to check with their airlines before travelling. A spokesman said: "There's quite a bit of disruption." All Arriva bus services in Runcorn, Southport and Skelmersdale were cancelled while Stagecoach Merseyside services across the region were also disrupted. Rail services on the Wirral Line were subject to delays although a spokesman said the situation had improved throughout the day. Bus operators in Greater Manchester were reporting major disruption and delays in the west of the region, which was expected to continue until Sunday morning. Bolton, Wigan and Leigh are the worst-affected areas, with few services running, Greater Manchester Passenger Transport Executive (GMPTE) said. With temperatures forecast to plunge to about -10C overnight, the authority said the disruption could continue into Sunday morning. Manchester Airport said it was "business as usual" despite the snow, with minimal disruption. However, British Airways cancelled all domestic flights from Heathrow until 1700 GMT so passengers were advised to check with the airline. One motorist, Stephen Derbyshire, told BBC Radio 5 live on Friday night that he had spent hours stuck in his vehicle on the M6 with a pregnant colleague. He said: "What is particularly frustrating is the lack of information here, and we've only seen emergency vehicles pass us twice within the last three-and-a-half hours." He added: "Luckily my pregnant colleague is coping fairly well with it but there hasn't actually been that much snow, I mean I would say there's four, five inches of snow and it shouldn't really cause this amount of mayhem." The Met Office said the worst of the snow had left the region on Saturday morning, leaving a cold but otherwise dry day. A widespread frost was predicted overnight with warnings of icy stretches becoming widespread on roads and pavements on Sunday.